The Chief of Army Staff (COAS), Lt.-Gen. Tukur Buratai has charged field commanders to complement whatever approach they take in prosecuting the ongoing counter insurgency operations with offensive posture. The COAS, yesterday, ordered a thorough investigation of the discovery of militia camp at NYSC Orientation Camp, Nonwa Gbam, Tai Local Government Area (LGA), Rivers State by troops of 6 Division Nigerian Army, according to Nigeria Army’s Twitter handle, HQNigerianArmy. 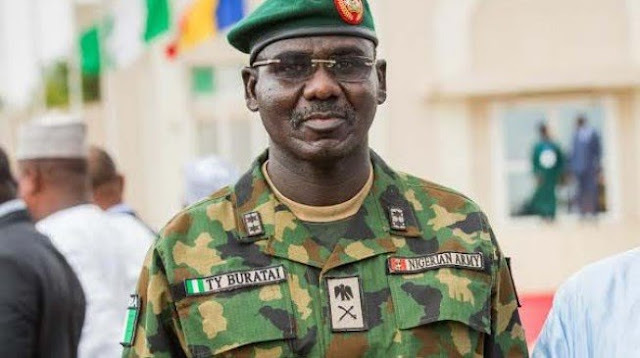 Buratai, who gave charge yesterday in Maiduguri at the conclusion of the Fourth Quarter Chief of Army Conference, said such posture was necessary to instill fear in the terrorists. According to the News Agency of Nigeria (NAN), the Army chief warned troops not to be deterred by the recent setbacks, especially at Metele, where the Boko Haram terrorists attacked troops of 157 Task Force Battalion, killed 23 of them and wounded 31 others.“Operational commanders at all levels must show leadership and inculcate such virtue in subordinate commanders. He expressed satisfaction that the objectives of the three-day conference had been achieved without giving details, but charged commanders to ensure that decisions reached were implemented.